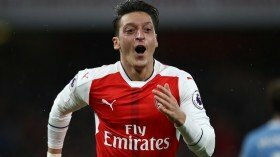 Arsenal manager Unai Emery has said that Mesut Ozil's substitution at the halfway stage of the Premier League game at Brighton & Hove Albion was a tactical decision. The Germany international recently made his first league start in more than a month during the 3-1 win over Burnley where he produced a strong showing which included an assist. However, he could not replicate the performance during the first period of the Brighton clash and this urged Emery to bench him with the choice of formation change. Speaking after the game, Emery acknowledged that Ozil had not sustained any kind of injury and the substitution was purely tactical, he said: "No, it's only tactical. Because we changed from 4-4-2 and this is only a tactical decision." Arsenal are currently fourth in the league standings with 38 points on the board but they could potentially be leapfrogged by Chelsea, should they either pick up a draw or win at Watford.